A fairly new partner of Slava Ganelin, Esti Kenan Ofri (dance and voice) feels especially intimate with the singing traditions of Sephardi Jews and the classical Arabic music. In 1988 Luciano Berio wrote for her a leading part in his work "Ofanim", a part she has sung on many occasions accompanied by many renowned orchestras such as the Berlin Philharmonic conducted by Claudio Abado. She's been also performing with percussionist Oren Freed presenting a special approach to Spanish-Jewish tradition of dance and music. While the name of Vyacheslav Ganelin is well known all over the world, the name of Esti Kenan Ofri might be fairly new to the followers of improvised music. She was born in Italy and raised in Israel. At the time of this release Esti Kenan lives and works in Jerusalem. She studied dance and music in Israel and choreography in New York, and she feels especially intimate with the singing traditions of Sephardi Jews and the classical Arabic music. In 1988 Luciano Berio wrote for her a leading part in his work "Ofanim", a part she has sung since accompanied by many renowned orchestras such as the Berlin Philharmonic conducted by Claudio Abado. In 1990 she sang the leading role in Fabbio Vacchi's opera "il Viaggio" in Bologna, and two years later she performed in Toledo with Placido Domingo and the Israeli Philharmonic Orchestra conducted by Zubin Mehta. They sang Noam Sherif's "Passion Sephardi" marking the 500th anniversary of the expulsion of Spanish Jews. In 1992 she recorded a CD entitled "Juego de Siempre" (The Game of Forever) under the auspices of the Museum of Jewish Doaspora. The CD is a collection of Judeo-Spanish songs composed and arranged by Betty Olivero and Oded Zehavi. In 1993 she completed the choreography and music for "A la Nana I a la Buba" for the Inbal Ethnic Dance Theatre, a piece based on Sephardi lullabies. Since 1994 Esti Kenan has been a part of a duo with the percussionist Oren Freed presenting a special approach to Spanish-Jewish tradition of dance and music. They performed together at the 50th anniversary of UNESCO in Paris, at Ravenna Music Festival, as well as other festivals in Europe. 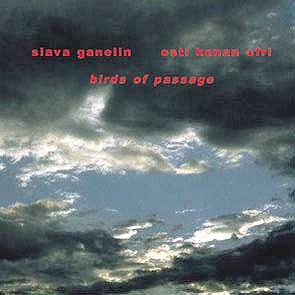 She has been performing with Slava Ganelin since 1998, and their first recording "On the Edge of a Dream" was released in Israel in 1999.